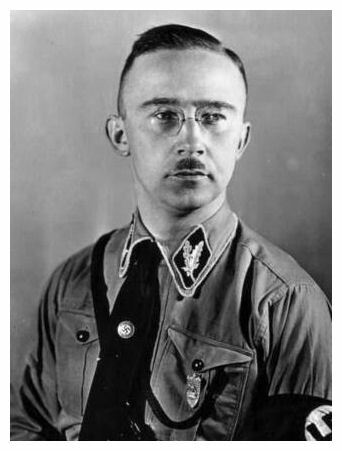 Heinrich Himmler was born in 1900 to a Catholic middle-class family in southern Germany. A bright student but also a loner, Himmler was fascinated by World War I and harboured dreams of becoming an army officer, but the war finished before he was old enough to enlist. The difficult economic conditions of the early 1920s forced Himmler to take a job in a manure-processing factory near Munich. During this period he made contact with members of the fledgeling Nazi Party and decided to join. Himmler participated in the Munich putsch but lost interest in politics after the uprising failed. Himmler worked briefly as a chicken farmer before returning to the party in 1925. He joined the Schutzstaffel or SS, then just a small division of the SA – and under considerable pressure from SA strong-men to disband. Himmler’s fascination with discipline, control and organisation impressed Hitler, who gave him command of the SS in 1929. This appointment surprised many in the party, who doubted the short, bespectacled, bookish clerk with a high-pitched voice could keep his position or keep the SS alive. Himmler, however, was a ferocious worker who defied this pessimism. Not only did he ensure the survival of the SS, he later transformed it into the NSDAP’s elite paramilitary force. He raised its profile, implemented recruiting strategies and expanded SS membership from just 300 to 512,000 by late 1939. One of Himmler’s main aims was to separate the SS from the SA, to instil it with rigorous discipline and loyalty to Hitler. He also envisioned an SS that would be the epitome of racial purity and Aryan supremacy. Through the early 1930s membership of the SS was restricted to those of Aryan stock; SS officers had to trace their family history back three centuries, to show the absence of ‘undesirable’ racial heritage. The SS became the paramilitary showpiece of the so-called ‘master race’. By the end of 1933, Himmler’s meticulous attention to detail had allowed him to become one of Adolf Hitler’s most trusted advisors. Himmler’s SS had developed into a fanatically loyal paramilitary brigade, protective of Hitler’s power rather than a threat to it. Himmler’s management of the Dachau concentration camp had also impressed Hitler, who in late 1933 gave the SS control of all such camps. In the middle of 1934, Himmler was able to persuade Hitler to order a purge of the SA leadership (the ‘Night of the Long Knives’). This event, carried out mostly by the SS, provided Himmler with further opportunities to increase his personal power and influence. In 1936 Himmler was made chief of all Germany’s police forces, including the Gestapo. Later, with the onset of World War II, he had ultimate command of the Einsatzgruppen (mobile killing squads) and the network of death camps, such as Auschwitz-Birkenau, Sobibor and Treblinka. Himmler also directed the Waffen-SS, the combat wing of the Schutzstaffel. In 1943 he was made Minister of the Interior, and in late 1944 he was given command of an army group battling the American forces which had landed on D-Day. Toward the end of the war, Himmler attempted to distance himself from Hitler and negotiate a peace with the Allies. He was captured by British troops but committed suicide before he could be tried as a war criminal. 1. Himmler was SS leader, in charge of internal security, the overseer of the Final Solution, and Hitler’s most loyal ally. 2. He had no war service, but his fascination with discipline, organisation and structure earned him favour with Hitler. 3. Himmler was given command of the SS and transformed it into an elite and racially pure paramilitary force. 4. He was also Minister of the Interior, responsible for domestic security and a key figure in the ‘Night of the Long Knives’. 5. Historians have debated his contribution to Nazism, but his role as an instigator of the Holocaust is not in dispute. J. Llewellyn et al, “Heinrich Himmler”, Alpha History, accessed [today’s date], https://alphahistory.com/nazigermany/heinrich-himmler/.